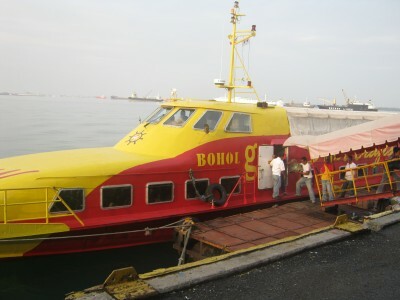 Just recently, I had a Day Tour in Bohol. This is the third one since the first time in September 2010. And just like my previous trips, I took somebody with me. This time though, it's my brother and his family. Overall, nothing is really new in Bohol except the following notable changes. Just like my previous two trips, I went to Bohol via Tubigon sailing between Cebu and Bohol in about an hour of ferry trip. And yes, it was MV Star Craft 2 that carried us. So what's new? The fare. It increased from 200 Pesos to 220 Pesos for an economy seat. Another one is, well, not new but new to me. Senior Citizens and kids have a 20% discount. Maybe students also have, but I didn't checked. For senior citizens, please bring your Senior Citizen ID. There is another new playground park with new statues and castles where kids (and adult alike) can enjoy playing. That is probably the reason why Sagbayan Peak hiked their entrance fee to 30 Pesos. 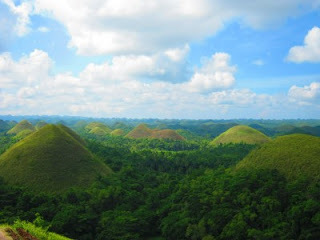 Have you climbed that 100-step stair in Carmen to view the hundreds of chocolate hills in the area? Unlike before, the stairs now have roofing to provide shelter for tourists during sunny and rainy days. And remember the part where people take pictures to depict them flying over the hills? Now it was already cemented but tourists still need to be cautious because the slopes are still unforgiving. Remember that large python? Before, viewing it costs 10 Pesos. Now its 30 Pesos. They renovated the place a little bit though. No, it was not the restaurants that hike the price but the government of Bohol. Before, the food costs 350 and the entrance is 50 Pesos. Now the entrance fee 100 Pesos, making the lunch-while-sailing activity cost 450 Pesos. Here's something new to me though. Senior citizens have a discount of 20% and kids costs just half. Anyway, although the price increased, for me, this is still one of the best parts of the trip. Where does the cost increase goes? I think the cost increase mainly goes to the maintenance of the roads and infrastructure that keeps Bohol a tourist friendly place. In all fairness, most, if not all roads in Bohol were in good condition. Bohol Day Tour is still worth the price especially for first time visitors. In my opinion, Bohol has a huge potential not only to become the most popular tourist spot in the country, but in the whole world. The people of Bohol as well as the government though should take the necessary steps now to protect and care for the wonderful gift of nature that the island have.